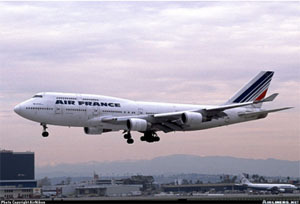 Air France Flight 072, a flight from Los Angeles, California to Tahiti was assigned the VOR DME approach to runway 22 at Faa'a International Airport. It was night, and the weather conditions were clear. The airplane was on a stabilized approach in the landing configuration with the auto pilot disconnected, and auto-throttles engaged. At the missed approach point, the automatic flight system initiated a go-around. The pilot of the aircraft physically held the throttles back with his hand, countermanding the automatic flight system, and continued the approach. During landing, the thrust lever for the left outboard engine slipped out of the pilot's hand and, commanded by the automatic flight systems, increased to full forward thrust. During the landing rollout, the thrust asymmetry generated with multiple engines in reverse thrust and one engine at forward takeoff thrust caused the airplane to veer to the right and depart the runway on the right-hand side, near the end, coming to rest in a lagoon adjacent to the runway. All passengers were successfully evacuated with only four minor injuries.